21) “Palimpsest” by Catherynne M. Valente. Author of the excellent Orphan’s Tales (Reviewed HERE + HERE) duology, Catherynne is really starting to make a name for herself and for me her short story was the one that I was most anticipating. Basically a preview from her novel of the same name (Bantam Spectra), Palimpsest is a viral city whose citizens bear parts of the city on their flesh and can be visited in dreams, while the plot “follows four such people as they search for others like themselves and a way to enter the city permanently.” As usual, the prose is excellent, the story alluring and the author’s imagination mind-bending… I can’t wait for the novel’s release! As mentioned I have this on reserve at the library, so I will get it soon, but this review/description made me order it; I had no idea what to expect since urban fantasy with vampires and sorcerors is not my cup of tea, but urban fantasy a la Mieville, Harrison, KJBishop is. 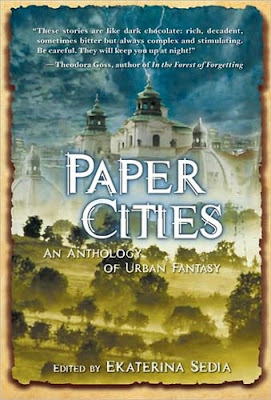 I like the cover very much but as you've said...I think the "urban fantasy" tag might be very misleading, if strictly from the point of understanding of majority of readers (not modern cities and very little werewolves,vampires and such; correct?). Great review though! gratz. Btw, I finally linked your blog :) Sorry it took so long. I've been meaning to for a while now. Great review of "Before They Are Hanged"! I finished reading this a couple of weeks ago and I had much the same conclusions as to the stories (I'll try to write a review within the next week or so, but I'm considering pairing this with the Datlow-edited Del Rey Book of Science Fiction and Fantasy, so it might have to wait until I am done with that anthology). As for the meaning of "urban fantasy," what else can one call scenes that transpire in city settings but that? I think the point of the anthology (I raised this question in passing with Sedia in my January interview with her) is that "city" occupies so many different places and conceptions within the mind as to make one streetcorner vary so much from another. Considering it from that angle, I believe this anthology does quite well in achieving its goals.